The Disability Access Route to Education (DARE) is a college and university admissions scheme which offers places on reduced points and extra college support to school leavers with a disability who have completed an Irish Leaving Certificate. HEAR has been set up by a number of colleges and universities as a result of evidence that has shown that disability can have a negative impact on a student’s access to college. What are the benefits of the DARE Programme? Reduced Points Places: Each college has reserved a number of places for HEAR students at lower Leaving Certificate points. Extra Support: Extra academic, personal and social supports while at college such as Assistive technology, learning support, library support, academic tuition and an educational support worker. School leavers under the age of 23, as of 1st January 2015, who have completed their Leaving Certificate exams. In order to apply applicants must meet a range of requirements and must have the ability to benefit from and succeed in Higher Education, but who may not be able to meet the points for their preferred course due to the impact of a disability or ongoing illness. How do I know if I’m eligible to apply to DARE – what criteria are used? 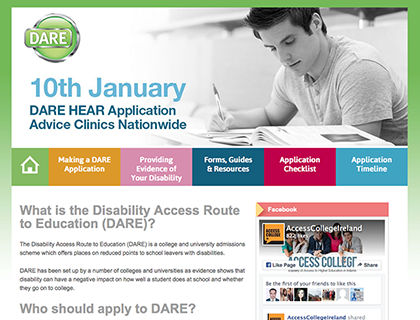 For further information on the DARE programme please visit http://accesscollege.ie/dare/.